3 Where Do Mourning Doves Live? 4 What Do Mourning Doves Eat? The mourning dove is a common enough sight across North America, but nevertheless many people don’t know how to identify this graceful creature. This is perhaps understandable, because with their beige feathers they’re not the most conspicuous of birds. Still, there are certainly ways to identify the mourning dove, at least to a trained eye. The two most distinguishing characteristics you’ll notice about the mourning dove are its plump body and long, thin tail. In comparison to their larger body, their heads and bills can seem particularly small, as can their short legs. The mourning dove has evolved so that its plumage blends into its open-country environment, leaving it with delicate, predominantly tawny brown feathers. Their feathers, however, are dotted with black spots on their wings and their tail feathers are white with a black edge. Of course, these traits apply only to the adult mourning dove. The babies are another story entirely. Mourning dove eggs are incubated for about two weeks before hatching to reveal the patchy-feathered baby mourning doves. The babies are then fed “pigeon milk” from the mother’s crop for the first few days, then will receive partially digested food from their parents. Another two weeks will go by before the parents leave the nest. As the babies get hungry they will fly down to look for food, then the parents will return to feed them. The adult mourning doves will continue to look after the fledglings for another twelve or so days, by which point the children will have departed. Where Do Mourning Doves Live? Mouring doves are seen all over North America, with the exception that they don’t often make nests deep in forests. They’re a textbook example of an edge species; preferring to live in thin trees, fence rows, and on the edge of human habitats. It’s not uncommon to see the mourning dove eating from a bird feeder or building a nest a small distance away from a home. This has caused experts to speculate that the mourning dove may find some kind of protection from natural predators by staying closer to humans. It’s not surprising that mourning doves can find a niche in human-populated areas, given their dietary needs. Mourning doves eat solely on the ground, usually seeking out the seeds of crops like corn, wheat, etc. When crop seeds aren’t available, they’ve been observed to eat things like wheat and grass seeds. As you might imagine, this makes them very common sights in rural backyards, especially if there’s a field nearby. They’ve even been seen in urban areas, eating the grass seeds out of people’s yards and having snacks from feeders. Their nesting habits also make them particularly suited to adapt to human spaces. When available, mourning doves will usually make a nest out of twigs either in a tree, or occasionally on the ground. Mourning doves, however, can be crafty creatures. They’ve also been observed to make nests in in flower pots on patios and porches! Whatever concerns mourning doves have about survival, humans do not seem to be one of them. When they make nests in human spaces, they’ll typically look for spots under a roof to protect them from inclement weather, which brings them ever closer to humans. 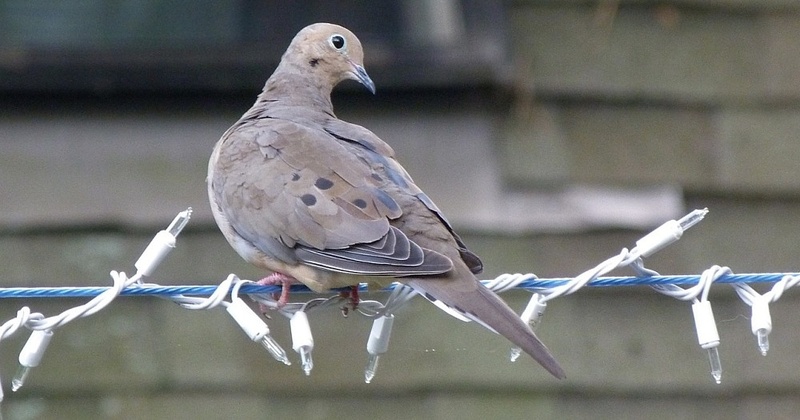 Naturally, the mourning dove will lay eggs in the nest, but that of course requires their mating practices. Before the mating ritual begins, males will often release a mating call. This almost whiny call is a kind of “coo-woo” sound, which can easily be mistaken for that of an owl. As a side note, they also have a nest call for males to draw their mates back to the nest, a greeting call, and even an alarm call. The mourning dove calls, particularly the mating call, tend to sound plaintive and desperate, which is how they got their name. Mourning doves have a somewhat odd trait, in that their wings make a kind of whistling sound during take off and landing. The courtship ritual begins when the male makes a noisy flight with his wings, then gracefully glides with his wings outstretched and head down. The male will then land before the female, push out his breast, and make the mourning dove mating call. If she accepts, it’s not uncommon for mates to preen each other’s feathers. The male then proceeds to lead the female to several potential nest sites until she decides that one is suitable. They’ll then build or find a nest as described above, with the male fetching the materials and the female building. It doesn’t take long for mates to create their first clutch of eggs, and thus the cycle repeats itself. You can listen to the mourning dove sound here. Doves have great symbolic meaning in Christianity. For example, according to the bible, when Jesus was baptized “he saw the heavens being torn open and the Spirit descending on him like a dove” (Mark 1:10). It was also a dove that Noah released from the Ark to see if the great biblical flood was over. And doves are almost universally considered to be a symbol of love and peace. Indeed, legend has it that the dove is the only bird into which witches and the devil can’t transform themselves. The mourning dove is the state bird of peace for Michigan and is also the official symbol of peace for the state of Wisconsin. There you have it, the life and ways of the mourning dove. While these birds are common, they are undeniably beautiful and friendly creatures. The next time you come across one, which is sure to happen if you live in North America, think about the ways of these stout birds. They are as clever as they are populous, and have certainly earned more than a little respect. For more fascinating information about this bird, check out these fun mourning dove facts. Hey Buddy!, I found this information for you: "The Mourning Dove Bird". 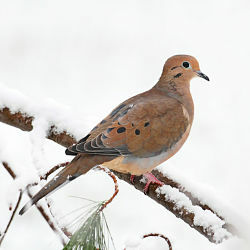 Here is the website link: http://backyardbirdingblog.com/mourning-dove-bird/. Thank you.